Traditional shooters are a dying breed. Being one of the oldest video game genres, the shooter, known nowadays as ‘shmup’ (shoot ‘em up) became popular in the arcades, with one of the most famous and pioneering genre leaders being the classic Space Invaders. 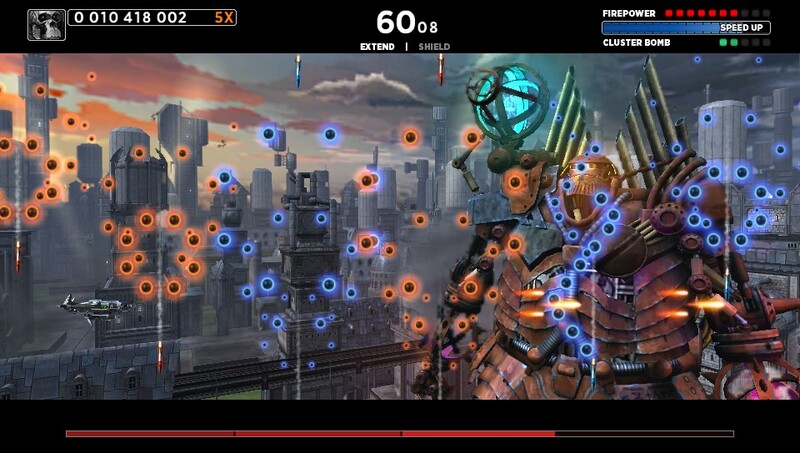 The genre is defined by a horizontally or vertically scrolling screen, with enemies, bullets and occasionally obstacles searing towards the player. With the 3D invasion of the N64 and the PlayStation, classical 2D genres such as side scrolling platformers and shmups were existentially threatened. The former has managed to recover and settle in nicely among the wealth of 3D games and has found its niche in cheaper indie and iOS titles, with the exception of a red-capped Italian plumber. Simple shmups have already appeared on iOS and Android, but the genre has not regained widespread popularity yet and even the modern champions of the genre have remained exclusive to Japan. Sine Mora is, in this context, a welcome addition to the Vita’s library as it adds to the variety- and it doesn’t just copy the shmups of old. Time is one of Sine Mora’s central focal points. The story revolves around a race of anthropomorphic animals threatened with extinction as it is oppressed by the Empire, a force you will be fighting against throughout the game. Another story thread describes the a father wanting revenge after his son was killed by the hands of the Empire’s men. And before I forget the drivel, it also has something to do with time travel. The narrative takes the shape of, on the one hand, static pieces of text before each chapter which explain the situation and the events leading up to those taking place in the game. It tries to convey drama and misery but utterly fails in injecting these emotions into the brain of the player since the story is extremely convoluted and you can never tell what is going on. The second pieces of narrative are found at the start of each chapter and consist of the pilot communicating with one of the other rebels. These parts give a clearer insight into what the player is actually doing and provides you with the motivation for shooting your enemies. An interesting narrative choice is the voice acting- it is all Hungarian, consolidating the odd and ‘distant world’ feel the game already has to it. The gameplay is much more important (when did shmups care for story, anyway?) and luckily, quite a bit better. Sine Mora is a revival of the genre, and is quite a unique one at that. It does not shamelessly copy mechanics of older and popular shmups, and instead delivers its own take on the classic side-scrolling shooting action. Time is again the crux here. Instead of a standard amount of hits that kills you, there is a time-based system in place. A counter is ticking the time away, and you restore this meter by shooting enemies or gathering time pick-ups. When you’re hit, time is subtracted and some obstacles (like a gigantic laser raining down from the sky in one of the boss fights) even kill you instantly. 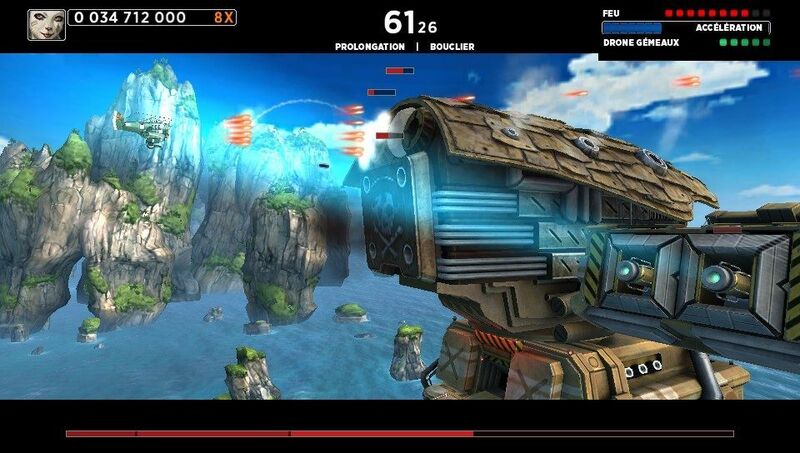 You also lose your combo, which can be devastating to your score in the game’s nail-biting arcade mode. 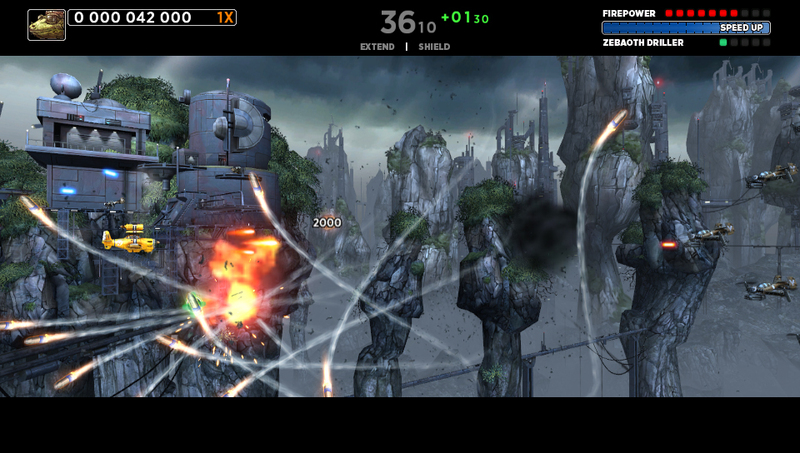 Sine Mora is a typical bullet hell shmup. For those unfamiliar with the term, a bullet hell refers to large quantities of damaging bullets being on the screen at the same time. You have to move quickly to avoid these bullets and at the same time shoot enemies and bosses all the while staying out of harm’s way. In Sine Mora, you can accomplish this by being extremely quick with your fingers and occasionally using the time slow down meter. This feature is accessed by holding down the R trigger (the X button shoots and the analogue stick moves the player’s ship). Once again, this meter can be replenished by pick-ups. The shooting power can also be upgraded through pick-ups. Your ship may start out blurting out a single line of bullet fire, and after absorbing a few floating orbs which are occasionally dropped by enemies as all other pick-ups and point coins, your fire may cover a quarter of the screen and be much more effective. This system is all fine and dandy, except for two things. The first is that, unlike traditional shmups, these pick-ups are dropped randomly. This takes a big part out of the fun of a shmup, since the main point of these games is to increase high scores. This is done by memorizing the stage and which enemy you need to shoot when to get certain power-ups and be able to continue more comfortably. The random pick-ups add in an element of chance which messes up this part of the gameplay. The second issue is that, when hit, you immediately let go of all of your power-ups. They then float off into the vast sea of bullets and quite quickly off the screen, making it very hard to reclaim them without losing a lot of time. Had this only been one power-up, it would not have been much of a problem, but with the infrequent time gauge drops and the frequent, extremely fast bullet hells I can’t help but think this system is a bit unfair on the player. Other than that, the gameplay is quite good. The stages themselves are not extremely thrilling, but the boss fights is where this game shines. The bosses are gigantic creatures ranging from an old war train to a huge insect, and they’re all out for your blood. Their bullet patterns are insane and really fun to master and evade, because you have to hit certain tiny parts in order to deal damage, and this can be quite tricky and tactical. You’ll need to use your secondary fire item (for which you, again, have to collect randomly dropping orbs) often. These come in the form of lasers, bombs and other weapons of mass destruction and usually do a little bit more than casually chipping away at the health of the boss. My favourite enemy was a huge, round labyrinth in which you had to shoot lasers who are obstructing your path and make magnificent use of the rotating nature of the puzzle in order to reach the center and destroy the mechanical monster. A lot of creativity and imagination has gone in designing these creatures and that definitely helps to cover up a few of the previously mentioned drawbacks. The locales in Sine Mora are also beautifully designed. The game is a fest of colour, and instead of the genre’s usually two-dimensional sprites the game uses full, three-dimensional models for all the ships and environments. The style is a realistic steam punk one, and the designs of all the enemies and ships are mechanically futuristic and imaginative. The bullets clearly stand out from the background, as they are blue or orange, neon-like dots. The ships, not so much. Very often there are ships flying in the background, and sometimes flying from and to the foreground, which makes it hard to distinguish which enemy is ready to get a few holes punched in him and which enemy is not. I am glad to inform you that you’ll get used to it after a few stages and that it is not a major issue. The action takes place in different places- sometimes you’ll be shooting hundreds of meters above the ground, and at other times you’ll be submerged under a thick blanket of water and are behind the wheel of a submarine. Some stages take place in a mine or an otherwise claustrophobic area, and can look beautifully (especially the lighting, which is great) but hinder progression greatly as one tiny flick of the Vita’s left stick causes you to bump into a wall and lose all your power-ups- it’s tricky steering in the dark. This does not feel particularly rewarding, but more so annoying and imprecise. Luckily, most of the stages are more open and give you the freedom to move anywhere you want; though that will cause some issues as bullets fill the screen for around 50% during most sequences. All in all, Sine Mora is a good revisit to the old arcade shoot ‘em up days. It breaks with some general formula ideas and offers fresh gameplay that is not without its problems. The story is incoherent and terribly told, but the amazing bossfights and good graphics more than make up for this issue. I would not advise you to play this game if you’re a high-score addicted shmup fanatic, but this game can be a great introduction to the genre and overall is quite fun to play. Good review. Yet to try it but downloaded it when it was free so will give it a go. Love the genre and thought this was an excellent schmup. I wish we had more of them. The vita has a lot of good schmups but no excellent ones yet. It can only be a matter of time. I’d say Velocity Ultra, albeit a deviation from the genre, is an excellent shmup. But it’s not quite a traditional shmup. Would Super Star Dust Delta be included as a shmup? thats a great game too !